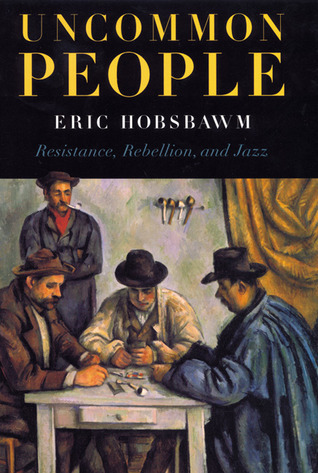 Uncommon People is a collection of Eric Hobsbawm’s essays spanning the majority of his long career, from the 1950s to the mid-1990s. It brings together a wide range of topics, collected under four headings: The Radical Tradition, Country People, Contemporary History and Jazz. Under “The Radical Tradition”, there are essays addressing Thomas Paine, the Luddites, the radicalism of shoemakers, the difference between labour traditions in France and Britain, the development of a distinctive working class culture, the skilled manual wage worker in Victorian moral frameworks, the iconography of male and female representations in labour movements, the origins and history of May Day as a working class celebration, the relationship between socialism and the avant-garde, and Labour Party stalwart Harold Laski. “Country People” includes two longer essays, one providing a general overview of peasant politics, and a second study of land occupations, as well as an essay on the Sicilian Mafia. The rubric “Contemporary History” features pieces Hobsbawm wrote while the embers were still hot, with pieces on Vietnam and guerilla warfare, May 1968, and sexual liberation. As a result they tend to feel dated, though as contemporary reports are still of interest for this very reason. Finally, the “Jazz” section contains half a dozen reviews and short writings on Sidney Bechet, Count Basie, Duke Ellington, Billie Holiday, jazz in Europe, jazz after 1960, and jazz’s relationship with blues and rock. A final essay, slotted under this Jazz heading, was written on the 500th anniversary of Columbus’ landing in America, and highlights the oft forgotten benefits and advances this event brought about, from the notion of a Utopia, to the development of a theory of evolution, and the spread of staple foodstuffs like potatoes and maize. The problem with this collection is that being of such a broad spectrum, only a handful of the essays are likely to appeal to the reader. Some of the pieces, particularly the shorter jazz reviews and essays, are written in an easy, affable manner, whilst many of the essays on peasant and working class movements are far more technical and heavily footnoted, and really require a background understanding to get anything from them. Nevertheless there are plenty of gems here: the essay on the Luddites amongst other machine-breaking groups highlights how the word inherited has little to do with the motivations of those people; his coverage of the development of a distinctive working class culture highlights the symbolism of something as mundane as the flat cap; whilst the essay on the Vietnam war and guerilla warfare has interesting implications for modern day conflicts such as in Afghanistan.